A charity that turns unwanted apples into cider is asking for the public’s help to save its community project this Giving Tuesday. The Orchard Project works to create, restore and celebrate community orchards across England and Scotland with a view to reconnecting people to their food sources. The 10-year-old charity also runs a community cider press, and has launched a five-week Crowdfunding campaign timed around Giving Tuesday to save the cider hub, using the global campaign as a catalyst to boost donations in its final week. Jo Hooper, Communications Manager at the Orchard Project, said: “We were aware of Giving Tuesday, but had not really maximised on its existence as a charity previously; we realised we could be doing more to push our cause. The charity’s Community Cider Hub is led by two female cider-makers and almost 700 dedicated volunteers have contributed to its operations. This makes it an asset to the local community, where people can come to learn new skills and increase their awareness of food waste and food preservation. With the aim of reducing London’s food waste, the charity’s volunteers collect surplus fruit which would otherwise be left to rot and turn it into handcrafted cider and apple juice. The Orchard Project, a national charity, has already rescued 13 tonnes of fruit since 2016. The project is now on track to hit its target of rescuing 20 tonnes of waste fruit and turning it into unique cider and juice by the end of the year. Unwanted fruit is donated and collected from London’s gardens, orchards and parks, as well as commercial supply chains more recently. The final product is 100% local with no air miles and a very minimal carbon footprint. Each bottle of cider can vary in taste, according to the harvest- the varieties of apples used in every batch vary depending on which fruit is donated. 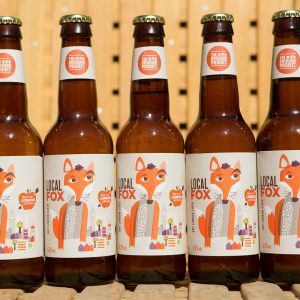 To support the project, visit https://www.crowdfunder.co.uk/localfox by December 10th. There are great rewards and incentives on offer to those who back the campaign, from cider gift boxes to exclusive artwork.